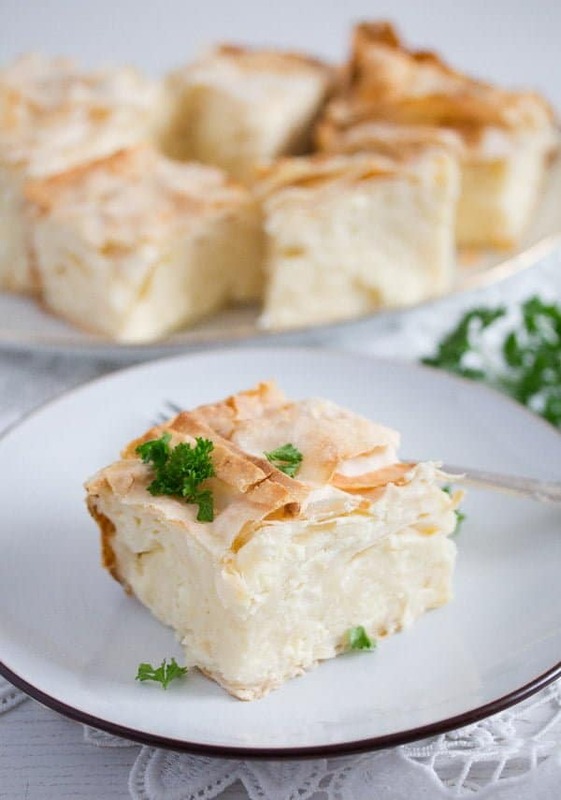 Gibanica – a Serbian recipe for a delicious layered cheese pie or cheese pita made with phyllo or yufka dough and lots of cheese. Gibanica is one of the most popular dishes in Serbia. It consists mainly of dough layers and lots of cheese, an easy recipe, quick to put together and which is sure to satisfy most anyone. I am saying most anyone thinking of my mother-in-law, who is such a picky eater it is a pain sometimes. She just looked at the pie and her expression was suddenly so tormented, I did not know whether to laugh or to cry. Genuinely afraid of the food, I am telling you, I only know a couple of kids worse than her, thank God not my kids… When I asked her if she wouldn’t at least want to try it, just a tiny bit, she said: “What is that??? It looks as if there is cauliflower inside…” The panic in her voice! No words for that!!! Because even if it was cauliflower, cauliflower is good, still no reason to completely block something. She eats cauliflower otherwise!!! 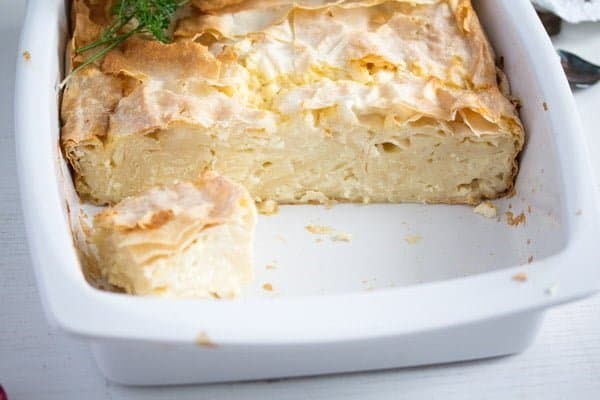 But don’t let that put you off this amazing Gibanica, it is one of the best cheese pies I have ever made, similar to my own Savory Cheese Pie with Quark, Feta and Yogurt yet somehow different. 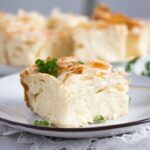 You will just love those pastry layers filled with that salty and comforting cheese, everything so soft and satisfying. And we were five adults and two kids eating and except my mother-in-law everybody loved the pie. Especially our guests, they had never had anything like it before and couldn’t stop eating the pie and they kept telling me that this is as good as cake and, although not sweet, almost like a dessert. Gibanica is a trademark in Serbian cuisine. 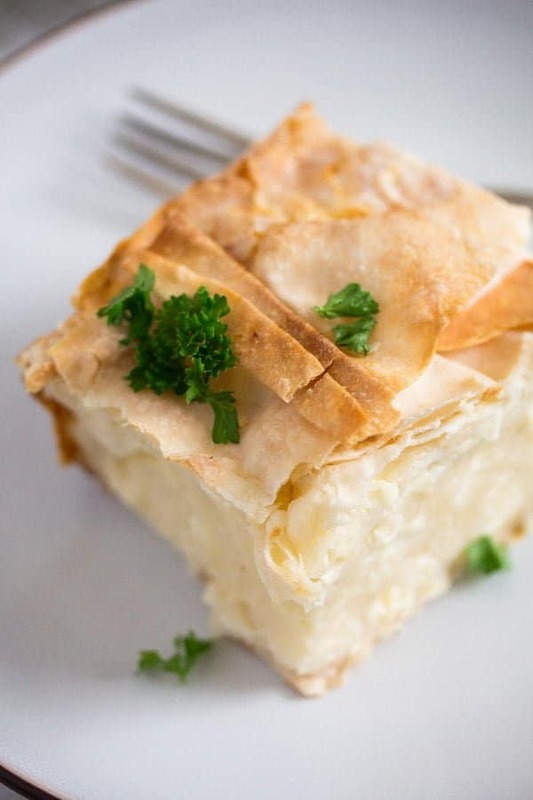 You can buy this savory cheese pie on every corner, it is baked in every family, there are even festivals dedicated to gibanica. Other former Yugoslavian countries have their own versions of gibanica, but the Serbian claim their version to be the true and original gibanica. Gibanica was created under the influence of the Austrian and Turkish cuisines. According to Wikipedia gibanica is “a type of layered strudel, a combination of Turkish and Austrian influences in different cuisines of the former Yugoslavia – the strudel is most often associated with Austrian cuisine, but it was actually the Turkish baklava pastry, introduced into Austria in 1453, that laid the foundation for strudel”. Gibanica can be eaten at any celebration in Serbia, not only for Christmas or Easter for instance, but at weddings, parties and so on, especially if they have a traditional touch. In these situations it is mainly served as an appetizer. 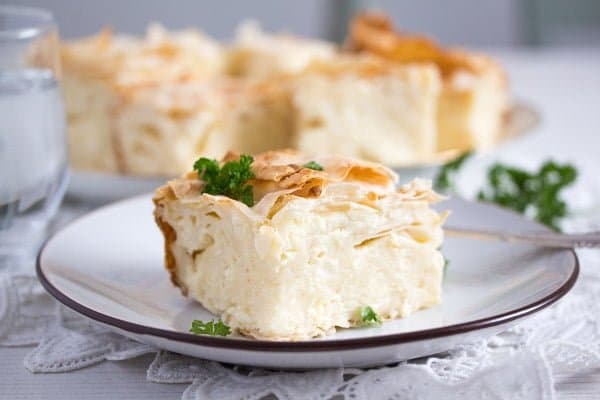 However, Gibanica or the Serbian Cheese Pie is not only eaten as an appetizer. If you choose to eat it on the street, you will take it on the hand and have it as a snack. Many Serbians eat it for breakfast with some yogurt. Or you could have it for lunch as a first course or in the evening as well. Gibanica can be served hot or cold, it can be reheated and it keeps quite well in the fridge for a few days. As a matter of fact, I baked this gibanica on Saturday. Today is Wednesday and I just had a piece of cold gibanica for breakfast, the last piece. It was delicious, a bit moister and even softer then on Saturday, but thoroughly good. I forgot the yogurt on top though… maybe next time. For some reason many people (me included some years ago) think that making this kind of pie is difficult. Well, it might get difficult if you attempt to make your own pastry, this kind of ultra thin pastry sheets are a fiddle to make. But, nowadays, that is really unnecessary. 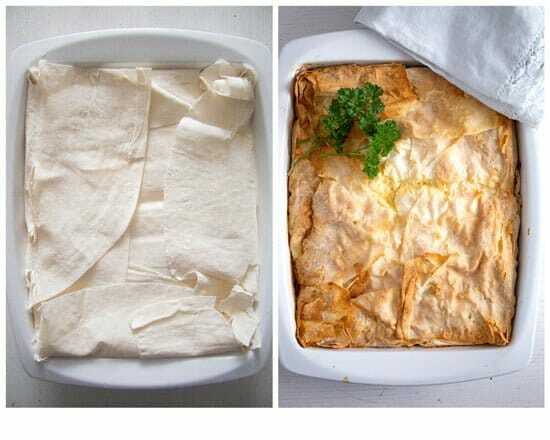 Buy a good quality phyllo or yufka dough and all you have to do is to open that packet and layer the pie. 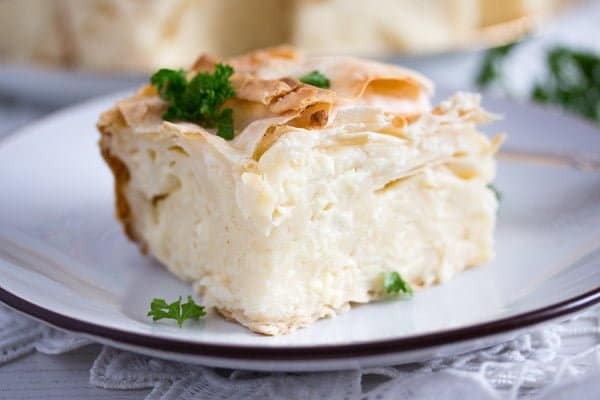 To make the Serbian cheese pie start by making the cheese filling. The Serbian use a traditional white cow’s cheese, which can be bought there at farmer’s markets and which give the gibanica its specific taste. However, as that kind of cheese is not available outside this region, substitutes had to be found. I substituted the typical cheese with a mixture of cow’s feta cheese, cottage cheese, sour cream and whole milk. To make the filling, give the feta cheese to a large bowl and mash it roughly with a fork. Add the remaining ingredients, including eggs and add salt to taste. The amount of salt you need depends on how salty the feta cheese is, you should definitely try the mixture and add salt accordingly. The mixture will be runny, don’t worry about it, it is supposed to be like that. 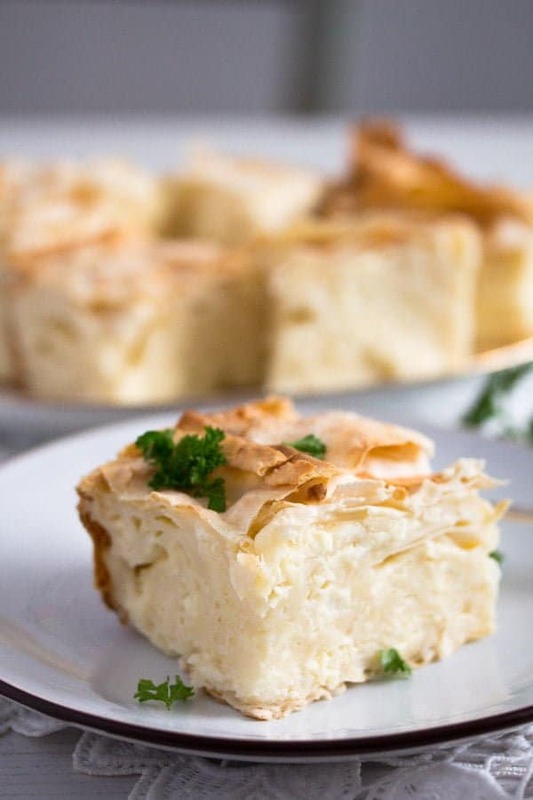 The reason it is so runny is because you will soak the phyllo or yufka dough sheets in this slurry, crumple them and place them into the pie dish, which has been lined with a double layer of dough first. When done, pour the remaining cheese filling in the dish as well and cover the pie with the last two sheets of dough. I used yufka dough because that is very easily available in Germany (and thus cheaper than phyllo or strudel dough as well). But phyllo or strudel dough can be substituted. I used the whole packet of dough, but use as many dough sheets as needed to fill and cover the pie. Leftover dough should be very well packed and used within a few days. When working with this kind of thin layers of dough, all you have to take care of is to not let the dough become dry. Only open the packet of dough after you have made the filling for the Serbian cheese pie. Have the baking dish ready as well. Once the packet of dough is open, work rather quickly and make sure to always cover the dough you are not using with a damp towel to prevent it from drying out. Only take the dough sheets out of the packet as you need them and kept them covered otherwise. First line the lightly oiled baking dish with two layers of dough. The dough sheets should hang over the edges of the baking dish, when you are finished with filling the pie, you will seal it using these overlapping pieces of dough. Place the bowl with the cheese slurry next to the baking dish. Take one dough sheet out of the packet, crumple it a bit (it doesn’t matter if it breaks a little) and dip and run it through the cheese mixture. Press it lightly into your hand to give it a rough round shape and place this crumpled dough into the baking dish. It is a bit messy, but that should not be a problem, that’s the way things are in the kitchen sometimes. Just make sure that the bowl with the cheese slurry stands very close to the baking dish, so that you can minimize the mess on your working surface. Fold the overlapping sheets of dough over the pie. Take the last two sheets of dough and place them over the pie as well. Brush the top of the pie with a mixture of hot water and oil and leave it to soak on the counter while you preheat the oven, my convection oven needs about 10 minutes to get hot. Bake the gibanica for about 45 minutes or until golden and set. As mentioned above gibanica can be served hot or cold. You can have it for breakfast, cold and with some yogurt. You can have it for lunch, hot and with a salad on the side or with some Ajvar, you can have it as a first course before a more substantial dish or you could have it for dinner, either cold or hot. The gibanica can be reheated in the oven and it keeps well for several days in the fridge. 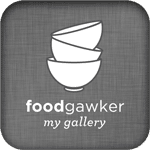 I hope you are enjoying this series on Where Is My Spoon featuring recipes from the countries participating to the FIFA World Cup. I know that my family and I are totally enjoying it, this way we got the chance to enjoy some amazingly delicious dishes, which we might not have known otherwise. Some favorites are this Portuguese Peri Peri Chicken or these Australian Lamingtons. To make the filling roughly mash the feta cheese with a fork in a large bowl. Add the lightly beaten eggs, sour cream, cottage cheese, whole milk and add salt to taste. The amount of salt you need depends on how salty the feta cheese is, you should definitely try the mixture and add salt accordingly. Grease the baking dish (approximately 30x22 cm/ 12x9 inches) with 1 tablespoon olive oil. Open the packet of dough, take out two sheets of dough, while keeping the rest covered at all times. Cover the dough you are not working with with a damp towel to prevent it from drying out. Work quickly. Place the first two dough sheets in the greased baking dish. 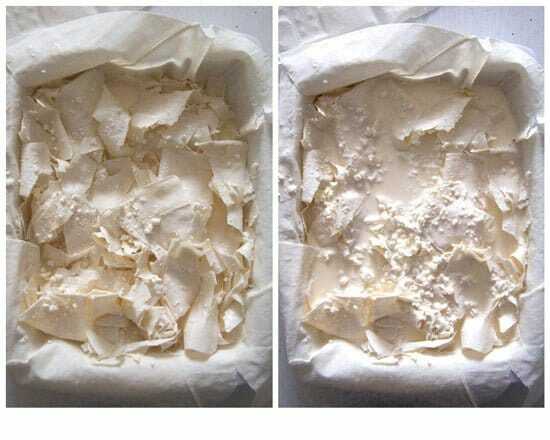 The dough sheets should hang over the edges of the baking dish, when you are finished with filling the pie, you will seal it using these overlapping pieces of dough. Place the bowl with the cheese slurry next to the baking dish. Take one dough sheet out of the packet, crumple it a bit (it doesn't matter if it breaks a little) and dip and run it through the cheese mixture. Press it lightly into your hand to give it a rough round shape and place this crumpled dough into the baking dish. Make sure to keep two last sheets of dough to close the pie, but otherwise use as many pieces of dough as needed to fill the baking dish. Pour the remaining cheese mixture over the crumpled dough in the dish. Fold the overlapping sheets of dough over the pie. Take the last two sheets of dough and place them over the pie as well. Mix together the remaining olive oil and 2 tablespoons hot water. Brush the top of the pie with this mixture and leave it to soak on the counter while you preheat the oven, my convection oven needs about 10 minutes to get hot. Preheat the convection oven to 170 degrees Celsius/ 340 degrees Fahrenheit or a regular oven to 190 degrees Celsius/ 375 degrees Fahrenheit. Bake the gibanica for about 45 minutes or until golden brown and set. Serve hot or cold as suggested above. I used yufka dough because that is very easily available in Germany (and thus cheaper than phyllo or strudel dough as well). But phyllo or strudel dough can be substituted. I used the whole packet of dough, but use as many as needed to fill and cover the pie. Leftover dough should be very well packed and used within a few days. Must be super yum with flaky pastry and feta! You are such a talented cook…I probably would end up damaging all the filo pastry while trying to getting through that cheese mixture. Beautiful pie! 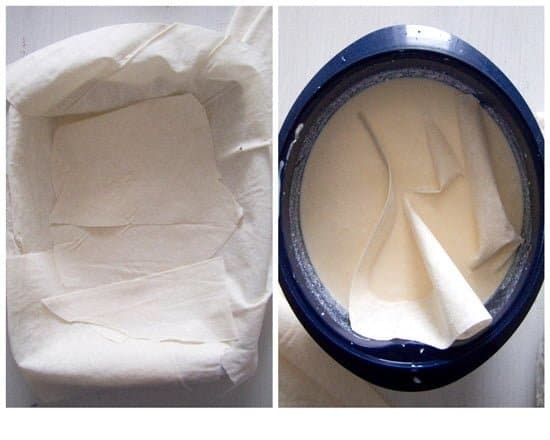 I remember learning about gibanica (though I’ve never tasted it) from a Serbian friend when we both realised Polish and Serbian “cottage/curd cheese” was exactly the same! As you know I love this cheese so I’m sure this pie is fabulous! (PS I know one picky eating friend who is afraid of anything he hasn’t eaten as a child… It’s so difficult to choose a restaurant when we go out together… I cannot convince him even to try Lebanese food… though it’s easier when he comes to my house: then he is less afraid of tasting new stuff!). You mentioned BAKLAVA as Turkish,but baklava is Greek, even the word is Greek. The Turks adopted it after the conquest of Byzantium. Yes, it is just so widespread all over the region, I suppose all of these countries claim it as their own. As for the origin of the word, I must admit I have never checked that.